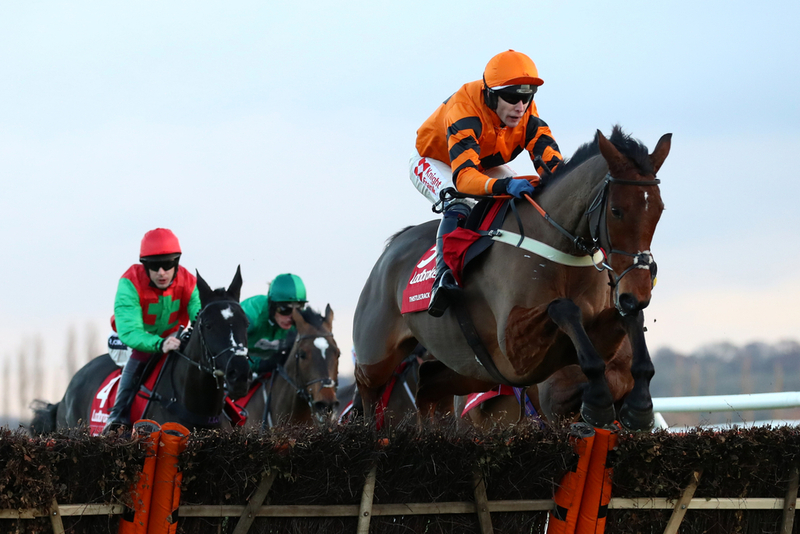 The first race of what promises to be an excellent two days of racing at Kempton's 32Red Winter Festival is the 32Red Casino Novices' Hurdle - a Class 2 contest which sees three last-time out winners, along with some nice prospects lock horns and it promises to be a cracker. This five year-old gelding, trained by Nick Gilford appears to be the most experienced in the field, and after a perfect start to the season we are confident he can keep on improving further. He recently recorded success at Ascot when fending off the challenge of Thomas Darby and although he meets that rival again off 3lbs higher, conditions appear slightly against his rival. Barry Geragthy is in the saddle also, representing a trainer he has a 100% strike rate for (2 victories from 2 rides) and we are sure he can continue that statistic and take the first in fine style. Up next it's the 32Red.com Chase Novices' Limited Handicap - a Class 3 contest over 2m 4f and Nicky Henderson appears to have a great chance of success with two promising individuals. However, we believe Lough Derg Spirit could be great value for success at around 11/2, who has had a short break after his last victory on seasonal return. He didn't jump with great fluency that day, though that was his first start prior to wind surgery and he returns here to a course he previously won well at, so we feel that operation by Henderson can only enhance him to go close again off the same mark. Santini performed impressively last-time out and he looks likely to take the first Graded contest of the afternoon in similar fashion. Nicky Henderson, the trainer, has won the Kauto Star Novices' Chase a grand total of four times, 1990, 1991, 2000 and 2009, and we feel his gelding will relish conditions and take his tally to five victories from six starts here. Last-time out this six year-old travelled well throughout after a long lay-off to eventually win comfortably on Chase debut, where his rival that day has since gone on to win next time and with that in mind we see no reason why he can't continue his progress here with that experience under his belt. We would advised no bet due to the odds in this race but we feel Buveur D'air will take all the beating and make it two consecutive victories in the Unibet Christmas Hurdle. This is undoubtedly one of the most interesting contests of the afternoon, not from a betting perspective, but a case of whether last years winner can win again. Many would argue last years success was a case of getting round safely and putting the race to bed against weaker opposition, which he did so in great style but here presents a different task. This is also the second leg of the Hurdles Triple Crown so a lot is at stake but if last-time outs performance is anything to go by, Buveur D'air should have no problem defying this better opposition and continuing JP McManus' excellent record in the race. Previously won the last two runnings, with Yanworth and our selection Buveur D'air. Now it's the big race everyone has been waiting for! The King George VI Chase, a Grade 1 contest competed over 3m, which sees some of the highest rated National Hunt horses bid for success. Our selection is the highest rated runner in the field, Native River, for Colin Tizzard who has previously won two of the last three renewals of this race with Thistecrack and Cue Card and he has a cracking chance of a win again here. Off the back of Gold Cup success he performed well to plug on for second on return when raced on conditions many would argue were unfavourable. Here, looks like the slower conditions he relishes will give him a great chance of going extremely close with Champion Jockey Richard Johnson aboard. Finally, day one of a great two days ends with a Class 3 Handicap over 2m 5f and our selection is a great outside bet at around 10/1 for you E/W backers. We've gone with the Ex-Irish Montalbano who was since sold from Willie Mullins' hands to another excellent Irish Trainer in Jonjo O'Neil for €52,000 back in October. Although this runner returns from a break his performance previously saw him go close in a Class 1 contest against Tombstone of Gordon Elliot. He returns off 4lb lower in the ratings in this particular race, and with the ease in Grade we see no reason why he can't hit the frame at the very least as he has competed against some of the best Irish racing has to offer.